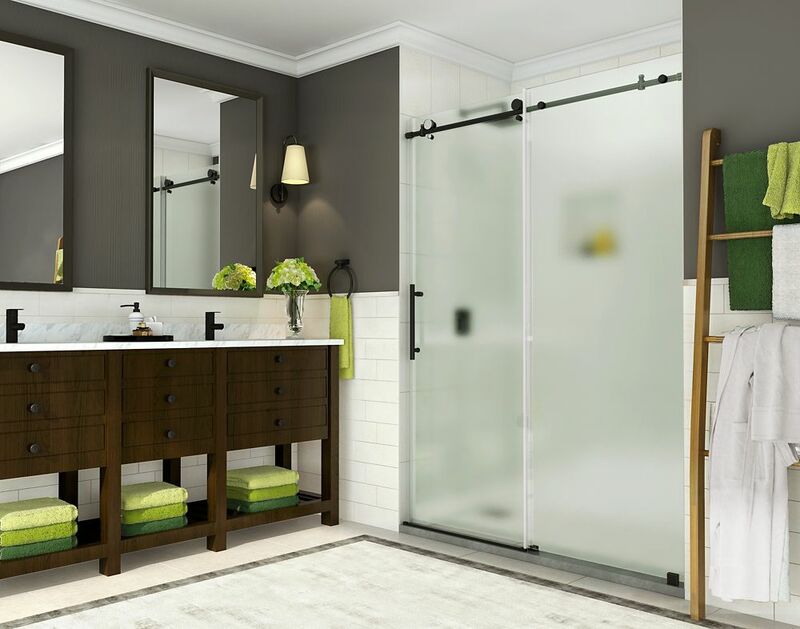 Coraline 56 - 60 inch x 76 inch Frameless Sliding Shower Door with Frosted Glass in Oil Rubbed Bronze With its clean lines and striking hardware, the Coraline Completely Frameless Sliding Shower Door creates the ultimate modern showering experience. This door is beautifully designed with premium frosted 3/8 inch tempered safety glass; tested and certified to ANSI Z97.1 Standard and an innovative two-wheeled sliding operation. The Coraline sliding door is available in a number of standard sizes and the top rail can be cut down up to 4 inches for an accurate fit. It is designed for either a left or right-hand installation and is available in multiple finishes. The Coraline door will create an open, minimalist feel in your bathroom and become a focal point. This model does not include the shower base. Images are for representation only. Glass may differ slightly than shown in image due to the nature of light absorption and reflection from your own bathroom's colour, design or decor palette. This is normal and should be expected in certain scenarios due to the glass's natural composition. Coraline 56 - 60 inch x 76 inch Frameless Sliding Shower Door with Frosted Glass in Oil Rubbed Bronze is rated 4.8 out of 5 by 34. Rated 4 out of 5 by John from Shower had all the necessary parts and appears to be... Shower had all the necessary parts and appears to be of good quality, which it should be considering the price. Larger screws were substituted for the screws that manufacture included for hanging the rail. The door threshold rail is a problem which I have not figured out yet. The end caps require attaching to the shower tile to hold the rail in place are located so close to the fixed door and the shower wall there is no way to drill straight down to anchor the caps. Installing the threshold rail is the last step in the assembly process. If I were doing this again I would have marked and drilled the end cap hole next to the fixed glass before installing the glass. That however does not solve the end cap attachment next to the shower wall. Open to suggestions. Rated 4 out of 5 by JJS from This door is quite heavy, which made the installation more... This door is quite heavy, which made the installation more challenging. The glass has a green hue which you can’t tell from the online picture. Overall it is a very nice product. Rated 5 out of 5 by LoveIt from love it! It's beautiful heavy and difficult to install...definitely a 2-person install job! love it! It's beautiful heavy and difficult to install...definitely a 2-person install job!